Hamas is a terrorist organization.. Palestine is to have no Jews in it, just like Saudi Arabia. Evidently the USA in no longer regarding the Oslo Accords as having any merit, for they are allowing the Palestinians, in planning their Palestine, to have a terrorist led government. Area A was to be exclusively Arab, no Jews. Area B was to be all Arab. Area C was to have "full Israeli civil and security control" and the plan was for Israel to withdraw from 13% of it, but they only were able to withdraw from 2% and the actions of the Arabs caused them to perform Operation Defensive Shield, meaning the Arabs had attacked more than could be tolerated which showed no peaceful intent. Hamas really brought this on themselves. Israel retains 61% of Judea-Samaria. The Palestinians also have Gaza as part of their state which has 141 square miles. Area C in Judea-Samaria, scene of Israel's ancient history of Israel and Judah found in the Bible , is now threatened by the USA being first to recognize an unsettled Palestine with a Fatah-Hamas government patterned after Lebanon's that will not have any Jews living in it. Area C was allowed to have Jews in the Oslo Accords. It amounts to 375,000 Jews who live there as of 2013, probably a few more today. The city of Ariel is the capital of this Judea-Samaria district. The 3 other cities are Betar Illit, Ma'ale Adumim and Modi'in Illit that house Jews. When the Assyrians attacked Israel in 720 BCE, the northern Kingdom fell and was renamed Shomron (Samaria). Judah was created after King Solomon had died in 920 BCE and his son, Rehoboam, became king. At the time of 722 BCE, Ahaz was king. The area of the Judea and Samaria district covers only 2,270 square miles which is but a portion of the ancient lands of Judah and Samaria. "In July 2012, a government-commissioned report by the Levy committee asserted, based on a number of reasons, that there is no legal basis under international law to refer to Judea and Samaria as "occupied territory". Article 43 of the Fourth Hague Convention of 1907 is the basis of the Levy Committee's opinion. Its opinion may be found on the Internet with an English translation" "The international community considers Israeli settlements in the West Bank illegal under international law," They call them "occupied territories." Israel calls them "disputed territories." Obama just settled the dispute by recognizing them as Palestine, state for the "Palestinian" Arabs, recent immigrants who left their homes at the creation of Israel and instead of returning when the fighting was over, remained in refugee camps where most remain today, taken care of by the UN. Israel was willing to go along with a 2-state solution, not wanting to change the nature of Israel as a Zionist state, refuge for Jews who were suffering from anti-Semitism, but can't accept a terrorist state bent on their destruction. Kerry didn't manage to change their minds about that, which was understood being they refuse to change their charter of Hamas nor their goal to destroy Israel lying in their hearts. There must be an international law that a state cannot be created that has a terrorist government intent on destroying its neighbor. This is what the UN was created for, to keep such things from happening. The UN is not living up to its original charter. It's not all over yet. So far the USA was the first to recognize this state and we haven't heard from the Western states as yet. First off, the PA violated the Oslo Accords by taking unilateral action and applying for membership in 15 different international organization for statehood. This went against the peace process and caused the halt to it, yet Kerry blames Israel. To top that off, the USA has hurried to be the first country to recognize a state of Palestine, a Palestine that will have a ruling government of Hamas terrorists just like Lebanon's Hezbollah government plan. Israeli MK Bennett came up with an idea that Israel should have sovereignty over Area C of Judea and Samaria back in 2010, but the USA crushed that idea quickly. Now, with the threat of having an honest to goodness terrorist state in their back yard, Netanyahu has to come up with a plan B as to what to do. He threw out the idea of the need to separate from the Palestinians, which is going to be some trick being they are so close. They did this once in Gaza and it was a complete mistake. A poll was taken and 60% of Jews opposed a unilateral withdrawal from the area. 20% of Israel's citizens are Arabs and 2/3 of them support withdrawal. What is the USA suggesting now that they have started the wartime atmosphere, something not expected in a peace process? They have the wait and see attitude like they had with Syria and Ukraine. Before recognizing Palestine they failed to get any written guarantees about peaceful behaviors from the Palestinians who are still dropping rockets on southern Israel. In fact it just happened today again and a rocket was shot into southern Israel, the 108th since the first of 2014. . Now, Israel can expect more terrorism to come from Judea and Samaria on the east side as well and continued shelling from the west from Gaza. Well, they said that they'll be watching all of that very carefully to ensure that that doesn't happen. Watching doesn't stop anything. It's been going on since 2001 from Gaza already and I haven't seen anyone try to stop the terrorists except Israel. So now they'll do the same thing and watch some more. USA is not about to get involved. They'll following the adage, "We don't mix in." Isn't this all prophesied in the Bible? Some great big blowout is expected to happen against Israel. I think John Kerry and Obama are not wasting any time getting the bombfire lit. 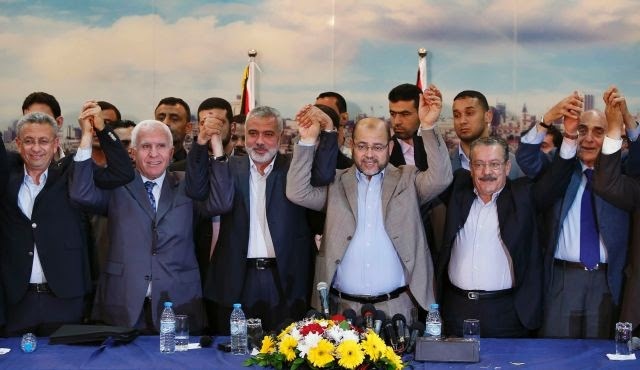 Hamas Interior Minister Fathi Hammad urged members of Fatah to join jihad and told them that “this is no time to back down” from destroying Israel.